The more I think about it, the more it just feels right that Jeremy O’Day’s first head coaching hire as a vice president of football operations and general manager is Craig Dickenson. They got here in different ways but their stories are quite similar. After O’Day retired as a player, he was put on the path to his current job quickly and it was obvious where he eventually wanted to end up. Dickenson, on the other hand, made it clear a number of times that being a bench boss was never the ultimate goal. For Dickenson, it was always about doing the job to the best of his ability, no matter the title. One guy clearly wanted the job, the other felt the timing and situation was right to give something else a try. While their roads travelled are very different, O’Day and Dickenson feel like two peas in a pod. They have similar stories of patience eventually landing them top jobs in their respective field. Both are highly respected CFLers who will get the chance to see if they can take the next step in their careers. So, in a way, it’s fitting that they’ll be taking this next step together. In all likelihood, their success or failure will ultimately depend upon each other. When Chris Jones left for the NFL he left behind an entire staff but uncertainty at in some key roles. Given the timing, there was a school of thought that had the Riders just getting through this season and re-evaluating everything next year. Dickenson seemed like an easy candidate for such an interim role, considering his long tenure in the CFL but seeming lack of interest in taking a head coaching role – and his snowboard instructor job over the winter. Instead, O’Day has hitched his wagon to Dickenson by giving him a three-year deal. Normally, that’s business as usual but in today’s football operations cap world, it shows the plan isn’t one and done. Nothing is guaranteed, but the pair plan to make this work for as long as they can. Will it? That will take some time to determine. That said, I think it will. Like the hiring itself, something about Dickenson getting this chance now feels right. Everything he said at his news conference made sense. Dickenson explained his role as the head coach is more or less to drive the bus while the assistant coaches do most of the day-to-day work. Like any good boss, he will let his people do their jobs. Dickenson will have to handle people, something he’s done for a long time as a special teams coordinator. He’s used to working with players from various backgrounds and skill sets. 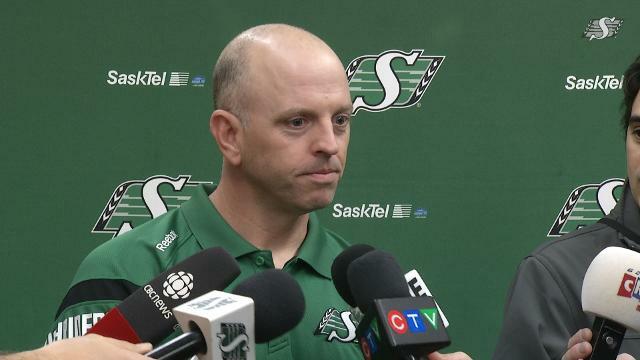 There were other names out there – notably Bombers offensive coordinator Paul Lapolice and Redblacks’ OC Jamie Elizondo – but in the end, Riders may just end up with the best person for the job. Great hires aren’t always flashy, sometimes they are just a logical, convenient decision. It can be easy to overlook the easy hire as just that, an easy hire. After a few weeks – if not years – of chaos, the Riders have calmly filled the Jones void with respected, talented people and signalled a new era in the process. Again, that just feels right.